When it comes to common technology in a laboratory, centrifuges rise toward the top of the list. Centrifuges separate particles and structures suspended in liquid by applying thousands of gravitational force equivalents to the sample through spinning and play a role in a wide range of workflows and applications. What is the maximum g-force the centrifuge can generate? How does the company’s centrifuge differ from other ones that can achieve the same speed and capacity? What kind of warranty comes with the centrifuge and what does it cover? If the company discontinues the product, for how many years do they provide accessories and parts for the centrifuge? Ask about cost of the purchase— not just the price of the product being installed but the total cost of ownership including price, service expectations, warranty, etc. Click here to read more about choosing the right centrifuge for you! The Infinite® 200 PRO NanoQuant was the first microplate reader to be developed specifically for absorbance applications with small sample size. This sensitive plate reader meets highest spectrometer capabilities covering the UV to NIR spectral range and is available with Tecan’s Quad4 monochromators™ or with UV-stable filters, and can detect DNA concentrations as low as 1 ng/MI. This affordable plate reader represents a simplified version of the standard Infinite® 200 PRO multimode reader and is compatible with Tecan’s patent pending NanoQuant Plate™. Read more about the Infinite 200 PRO NanoQuant on the Tecan website. The CE 7smart is the fourth generation of SOTAX flow-through cell systems and has been designed as the Apparatus 4 instrument made to overcome potential challenges linked to method development for a variety of dosage forms. 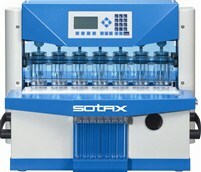 Visit the Sotax Corporation website the learn more about their dissolution testing systems. I need the preventive maintenance procedure for pharmatest PTWS 300/600/1200 dissolution apparatus. Advise this member. I have the above centrifuge. Does anyone know where the access port is for the emergency cord to use in the event the power fails and samples must be removed? There is no access port under the front ledge as the manual states. There is a black plastic cover on the left side right behind the fuse port but I have not been able to get that off. Is that the port for the emergency cord? If so, is there a trick in getting is off? Advise this member. Sorvall RC-6 - Alarm "ROTOR NO." My sorvall RC-6 centrifuge gives alarm message "ROTOR NO." above 3200 rpm, although the rotor number (SLA 1500) and its code (28) are entered correctly. Below 3200 rpm it works properly. What is this problem? How can it be fixed? Advise this member. With the FRITSCH Laser Particle Sizers ANALYSETTE 22 MicroTec plus (0.08 – 2000 µm) and NanoTec plus (0.01 – 2000 µm) particle measurement becomes a simple matter, for professionals as well as for any employee – in production and quality control or in research and development. No prior knowledge is required. Just start the programme, select a SOP and add the sample – the rest takes place completely automatic. Fast. Reliable. Efficient. Read more. Union Process, Inc., known globally as a manufacturer of particle size reduction and dispersing equipment as well as related services for a broad range of research and industrial applications, has manufactured and delivered another large S-400 Batch Attritor Grinding Mill. Read more. Hettich is a FDA registered manufacturer with over 110 years of serving applications in clinical, research and industrial laboratories. Hettich centrifuges are made with the precision of German engineering and are backed by Hettich’s Five (5) Year Warranty. Hettich offers a wide variety of centrifuges including benchtop, tabletop and floor-standing models as well as incubators and other lab accessories. Hettich centrifuges are utilized in a variety of applications, helping to keep labs running smoothly with accurate, timely results. With a knowledgeable support and technical service team Hettich is eager to assist should you need anything. Read more. Visit the Hettich website to see their full product line. When I turn on Victor 3 and the software, the following information appears: Unable to load Wallac 1420 Instrument communication server and/or initialize instrument. I would be pleased if someone could help me solve this problem. Advise this member. I have a problem with my machine. The machine and computer work normal, but it shows that the machine is offline, and I can not connect it. Could you tell me the problem of the machine and how to resolve it? Advise this member. The equipment is working properly but there is smoke coming out of the motor and it is smells like something burning. The motor is not showing oil or showing something wrong. What could be the problem? Advise this member.